Wow. Just when I start to think I am getting used to India, I am proven wrong once again. I had been looking forward to this weekend for a while, but I don’t really think I could have prepared myself for what I was about to experience. With my Service Learning class, we had been told we were going to be visiting a school and orphanage for HIV+ children, but that didn’t even begin to explain what we saw. When I imagine an orphanage, I usually think of the classic Charles Dickens novel, Oliver Twist!, a book and musical set in a dirty, rainy, muddy, and cold orphanage in England. On Friday, we drove to the outskirts of Bangalore and turned off the main highway to a little side street, and continued until we came to an enclosed campus of lush vegetation and respectable buildings. We walked a little further to a school for children with HIV/AIDS. I could not have expected how nice and well-kept the facilities were. Our guide was very welcoming and informative, and then showed us downstairs, outside, and to where the children were playing before dinner. My only complaint was that we could not stay longer. Although we were not allowed to take pictures of any of the children (to protect their identity), their faces stay in my memory better than pictures could have. I am still amazed as to how happy and smart the students were. One of the students took me to the classroom and read the names of all of his fellow students, and explained the pictures on the walls, and another showed me the animals back behind the building. I was taken to the garden, shown the flowers and vegetables, was asked to play on the playground, and spent a lot of time drawing pictures with many of the students. They were very appreciative of our time and attention, and their smiles were more than enough to make your heart melt. With that being said, though, I realize that there were still things in the orphanage that could be made better and that most orphanages in India are probably not up to par with the one we toured outside of Bangalore. Despite their huge smiles, many of the children had poor dental care, and their skin was riddled with lesions and scars. Our tour guide of the orphanage explained to us that the center was established to remain sustainable after the first couple of years of overseas support, but I still think more can be done. I don’t know how much can be done with the meager funds available to college students, but I hope to see how funds from the United States would be able to go to the healthcare of these children, guaranteeing them the healthiest and most productive lives possible. As I put online when I was talking to some of my friends back home, the time I spent at the orphanage is sure to be one of the most rewarding and longest-lasting experiences of this trip. After a very emotional day yesterday, today we went outside of Bangalore again, this time to visit with a rural village. Like yesterday, I was once again surprised with the smiles, laughter, and happiness of the children we came into contact with. After a long drive outside of the city, we stopped at a colorful little rural schoolhouse. After singing and dancing with the children, we left the schoolhouse and went to the village where we could talk to some of the local women. More than anything, I was amazed by the content attitude of the villagers we talked to. Despite not having some of the amenities we have back in America, they were perfectly happy. When asked if they wanted to move to the city, we were told that they were much happier in their village; life was simpler, and they had their family, which mattered most of all. It was very humbling to hear from someone who had so much less material wealth that they were perfectly content, something that makes me question the almost ingrained American materialism. After some time at a local house, we went to the Self-Help Group (SHG) of one of the villages, where we heard how Christ University’s Centre for Social Action had aided some of the local women to band together and raise money. Through this, the women act collectively to better their community and empower themselves in the home environment. View from just outside of the orphanage. I am sad I couldn’t take pictures with any of the children, but I hope I will be able to see them one more time before I return back to the States. This time gave me much hope for the future of these children. The women of this local Self-Help Group were kind enough to invite us to their meeting place and introduce us to how they come together as a community for a collective goal of empowerment and community strengthening. 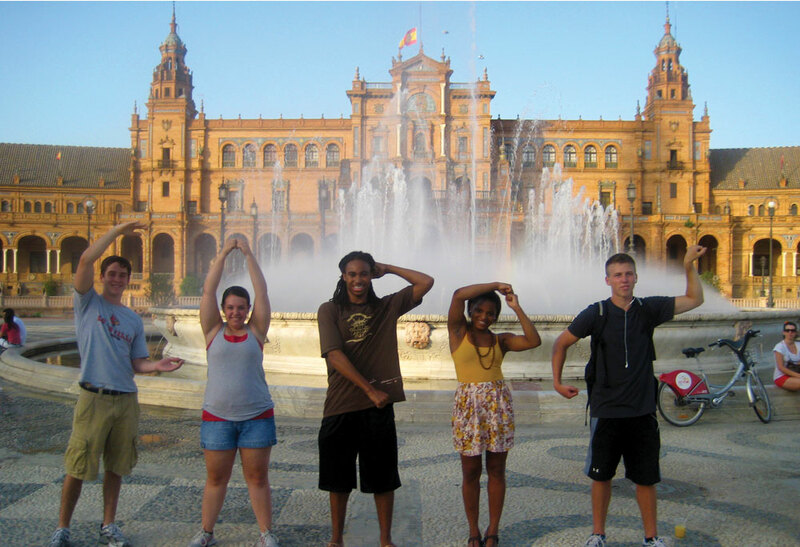 This entry was posted in Study Abroad by rmmora01. Bookmark the permalink.